"Due to unusually cold temperatures and rain in Northern California our supplier is currently unable to safely package bees and has had to temporarily suspend deliveries. The new, and still tentative delivery date dependent upon weather is... April 19." Virginia was exploding in flowers at the time, and I knew a package needed 25+ days to start producing new bees. The queen has to start laying and the eggs become larva become capped pupae before emerging as young bees. The bees in the package slowly die off during this time, so the hive wouldn’t be up and running until mid-May. 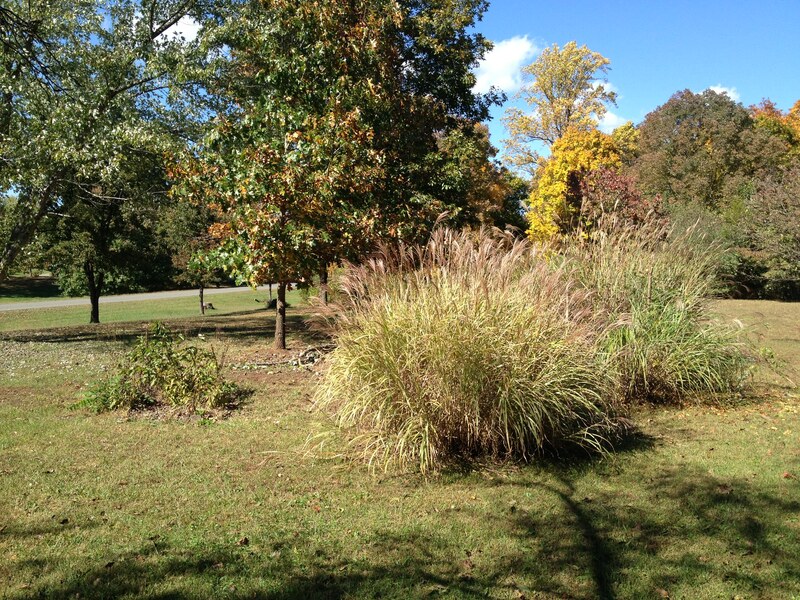 The apiary area on October 17, 2014 when I first started this blog. The silver lining was that I had an extra week to work on the apiary. Our rough patch of an old garden in the side yard had evolved into a half-ready bee area. 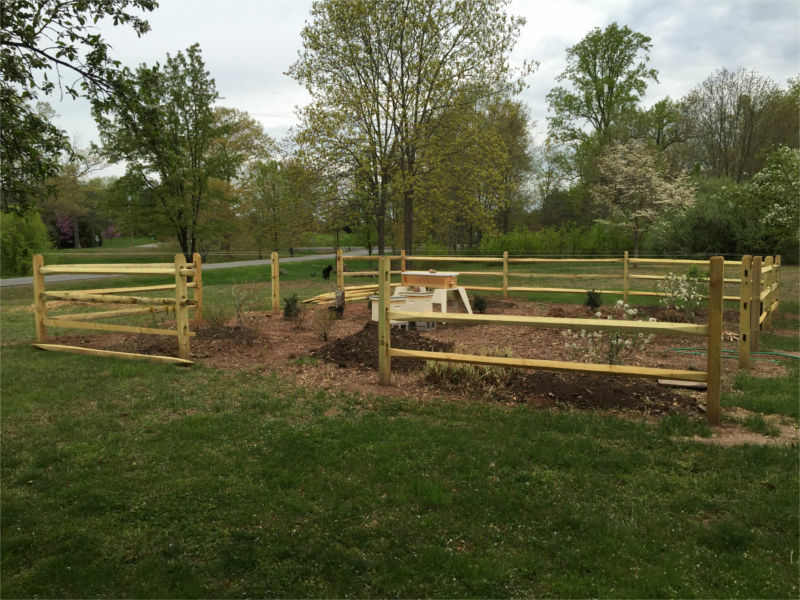 One week later, on Saturday April 18, the fence posts were in and the bushes were mostly planted. I had finished the second coat of paint on the TBH stand. Given the package was coming the next day, I figured I could set out and level the hive in the morning. I was ready. While the apiary still needed some work, I had a couple weeks before my nucs were due so I figured there was time to finish before the yard was awash in bees. 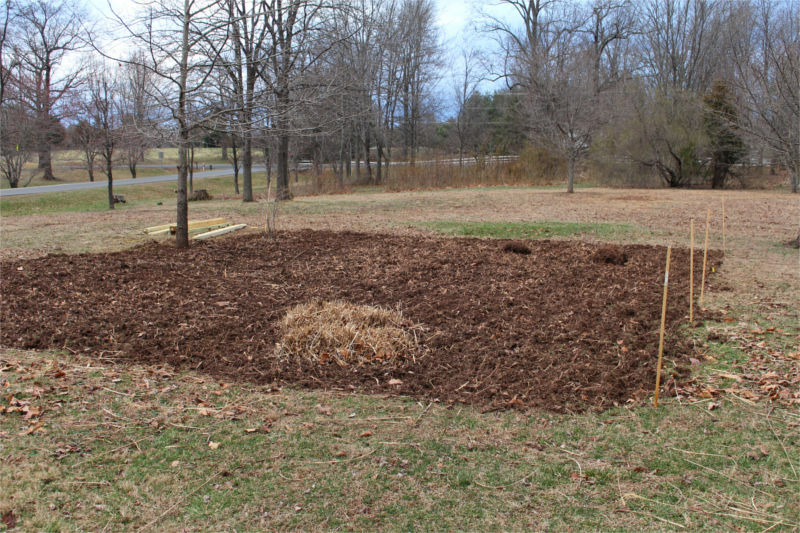 The apiary on April 3, freshly plowed. 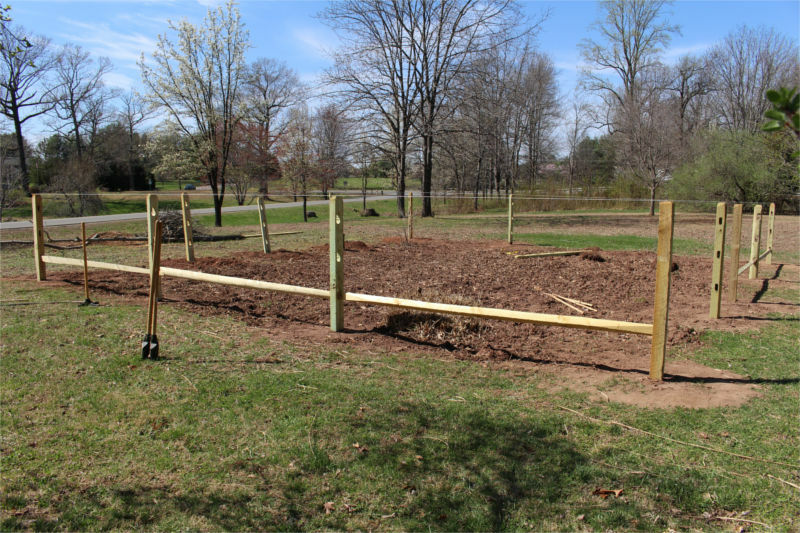 On April 12 all but two of the fence posts were set. “Hi Erik. I’m sorry to call so late, but we have some nucs ready and I wonder if you want to pick yours up tomorrow.” Lynn is also the daughter of Chris Hewitt, the maker of my nucs. We had two nucs of Russian bees coming on May 2nd, or so I thought. …and so forth. What to do? In the end, I didn’t want to pass up the chance to get my nucs, as I knew they would benefit from an earlier start. not to mention the current explosion of color. We had dandelions, grape hyacinths, hollies, viburnums, Bradford pears, and cherry trees in flower around our yard, and who knew what else in neighboring yards and the nearby woods. So I said yes. The day before the bees arrived. 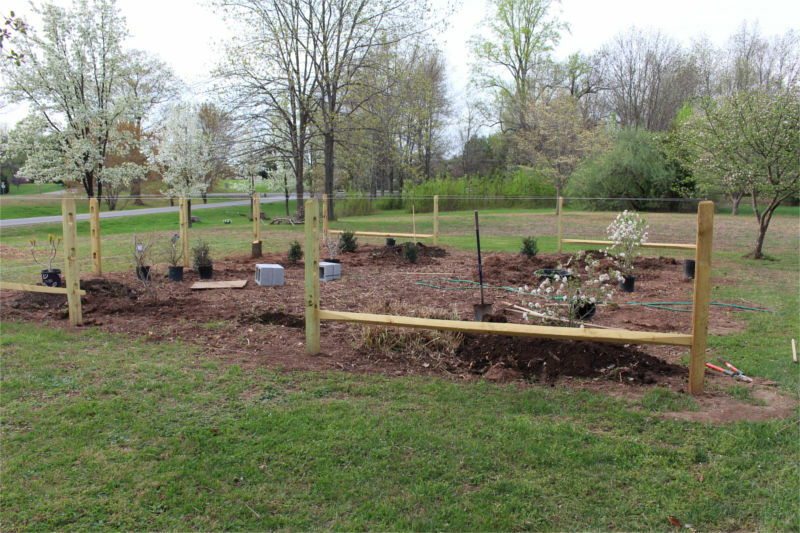 You can see the not-yet planted hollies, viburnums, and other plants in this picture. 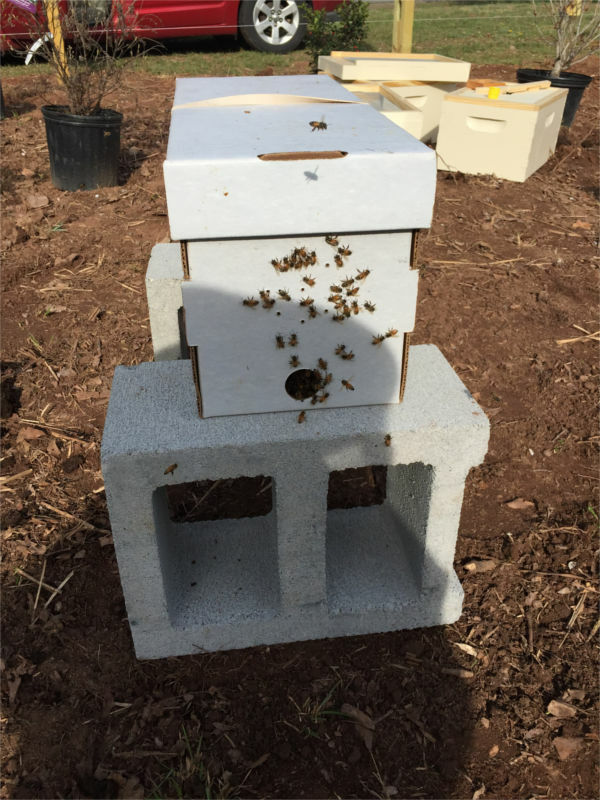 The concrete blocks are the eventual home for the Langstroth hives. Nothing like a deadline to prioritize your time. I mixed up some 1:1 sugar syrup (one gallon of heated water, an equal amount of sugar). 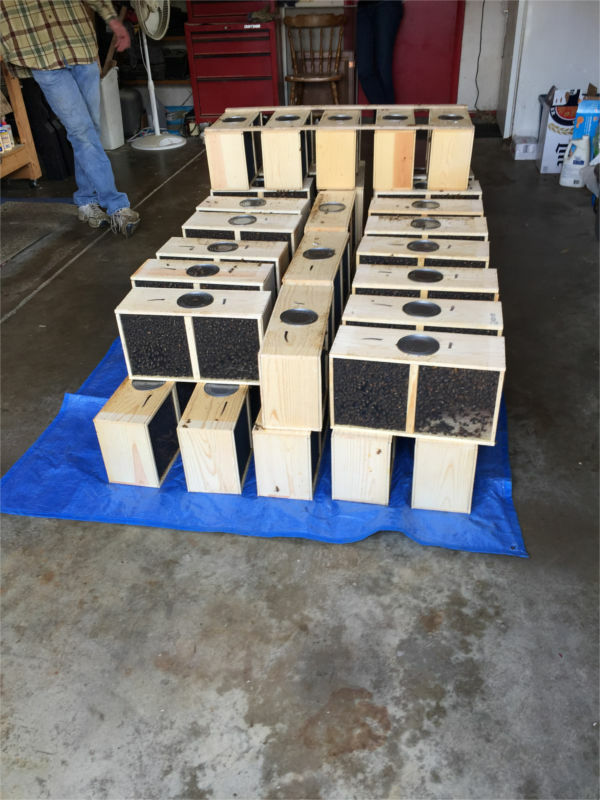 The nucs would have 5 frames, and I had boxes that held 8 frames, so I needed 6 more frames the next day. A few YouTube videos later (with conflicting instructions, of course), I was gluing and nailing frame parts together until 12:30 in the morning. After a nervous sleep, I was awake just after 6 am to add foundation. A thin sheet of wax in each frame gives the bees some guidance on where to build comb. Of course, for some reason I only purchased 5 sheets of deep foundation. Undaunted, I put a medium sheet (about 5 inches) into the final deep frame (about 8 inches). Hopefully the bees won’t mind. The first nuc at its new home. On to the hive setup. The ground was not at all level, so I didn’t get very far. Before long it was past 8:30 am and time to pick up my nucs. Chris’ yard was full of bees and hives and nucs, a real site to behold (thank goodness for the bee suit). Chris advised me to pick two lighter nucs, as they probably had more brood (bee larva) than honey, and this time of year more bees is more important that extra food. Back at the house, I set the boxes on concrete blocks, their future home. When I removed the entrance cap on the first nuc, the bees literally burst out of the hive. I was quite startled, but the bees were just happy to fly. 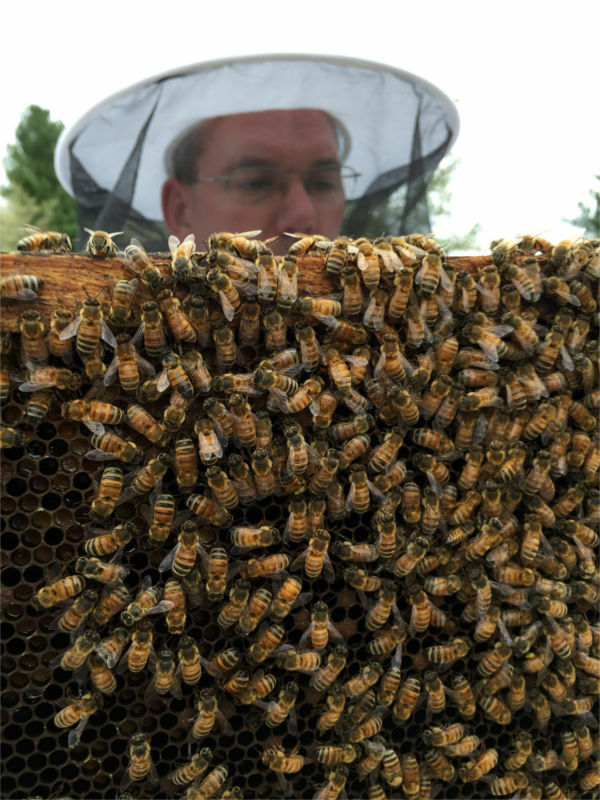 With bees orienting to their new surroundings, I returned to the house. Packages waiting to be picked up. Each package has over 10,000 bees and a queen. The queen is in a small cage. Next I picked up my helpers to arrive at Aunt Beas by 10 am for a demonstration of how to install a package. I counted 46 packages waiting for pickup. One feature of Pete’s demo was that he placed the queen cage on the floor of the hive. Since the side of his hives open up, this allows the cage to be removed without disturbing the rest of the hive. We picked up our package and made our way home. The warm sunny day seemed great for bees, and our two 8-foot holly trees were literally buzzing with honey bees as well as a few native bees. Hopefully some of them were from my new nucs. Not having a ready hive, I left the package in the shade near the house. I carried my jacket and equipment behind the nucs and was getting organized so I could level the top bar hive. Since the TBH bees would build natural comb with no foundation, they would follow the flow of gravity. So this hive had to be level. I waved my hand at a buzzing bee, and she stuck me on the neck. Ow! I scraped my fingernail across the spot and pulled out a stinger. Curses. My last bee sting was at least 20 years ago, so I hurried inside just in case I had a strange reaction (and to complain to my lovely wife, of course). I seemed okay, so after a few minutes rest and an antihistamine I headed back out. This time I suited up before I approached the apiary. Me holding the unopened queen cage. It took some raking and shoveling, but I managed to create a levelish area for the TBH. With some landscape cloth underneath to keep the weeds at bay, I set out the stands and placed the hive on top. Some small wooden shims finished leveling out the hive. 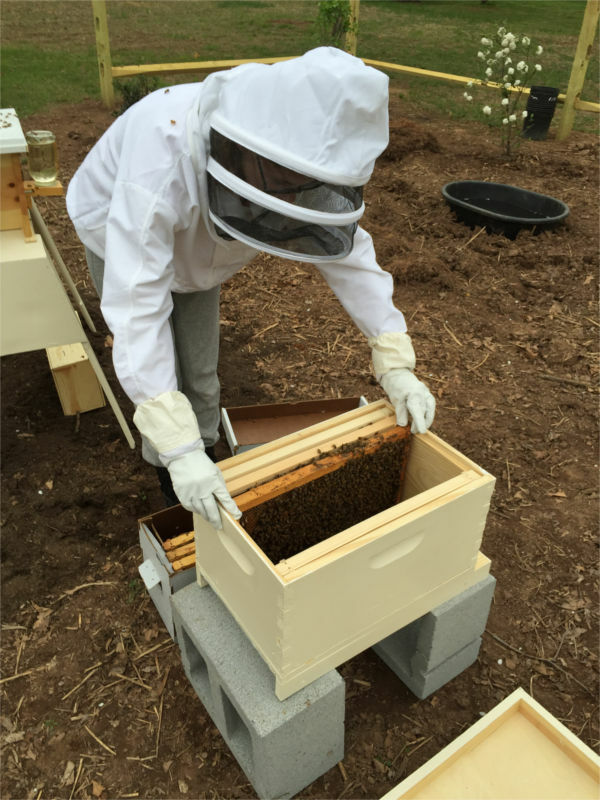 When my helper S returned from her afternoon activity, we suited up and carried the package out to the hive. It was after 4 pm, a little later than I wanted but still warm. We managed to remove the queen cage without releasing too many bees. I carefully pulled the cork with a hive tool and stuffed a small marshmallow into the top. A package is just a bunch of bees in a box, so they need time to adjust to each other and the new queen. If we released the queen immediately they might just kill her. I set the queen cage on the floor of the hive. I must admit it was all a little nerve wracking. My helper S was nervous at first as well, but after a few moments was calm and confident. I was very proud of her. She dumped the bees into the hive. We had the smoker lit (first time! ), but since Pete didn’t use any smoke or water we didn’t either. The package was placed underneath the hive in hopes that the remaining bees would find their way to the entrance by the end of the day (they did). We set a quart jar of sugar syrup on the boardman feeder at the front. We closed up the hive, crushing as few bees under the heavy cover as we were able. S moving frames into the hive body. 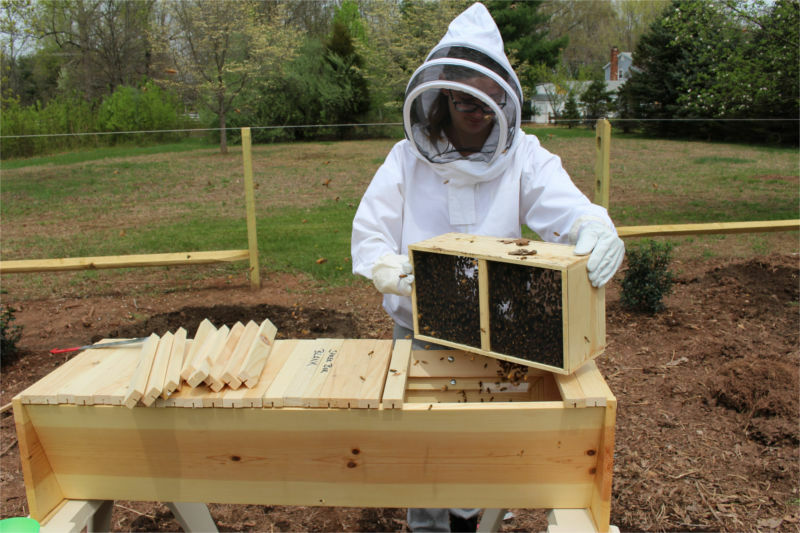 Next we put the Langstroth hives together: screen bottom board, deep hive body with three frames, inner cover, top feeder, and outer cover. Once again I was the concerned parent and tried to plan our approach. S told me not to worry and was ready to dive in. The concrete blocks were anything but level, so I might to address this later. With the foundation and existing combs as a guide it should be okay. I think. 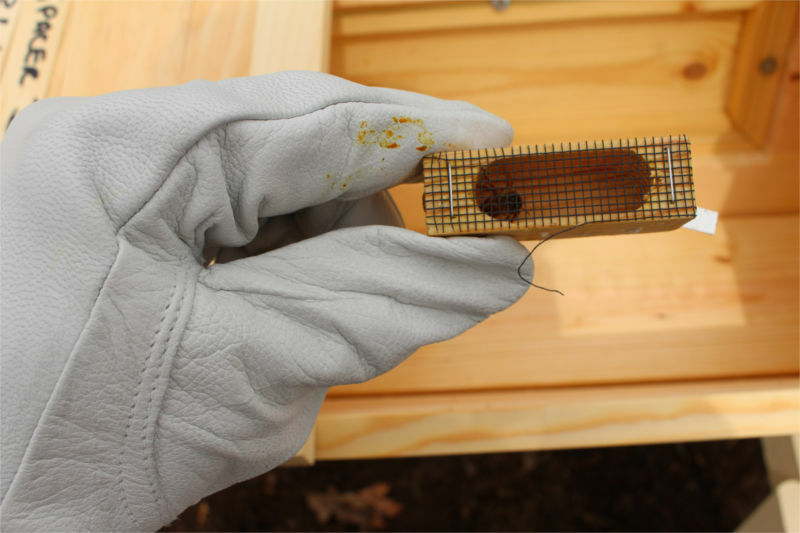 We carefully moved each frame from the nuc into the hive, as shown in the picture. We kept the five frames together in the middle, as Chris had instructed, and put our new frames on the outside. Reassembling the hive, we filled the top feeder with the sugar syrup in case they needed it. Since S handled the first hive, I did the second. I was a bit more confident with the second hive, so we looked at each frame in an attempt to find the queen. No luck. The bees were very gentle and were working away. They seemed satisfied with their new home, so we put on the inner cover and top feeder, again pouring some sugar syrup into the feeder. The top cover fit snugly over the feeder, and we were done. With a small sigh of relief, we put our equipment away and went inside. It was a hectic weekend, and I was exhausted, but we did it. The apiary today, on April 25, 2015. Still some work to do on the fence and the ground is a bit rough. The bees seem to enjoy it, so I can’t complain. Two days later on a cool evening we took a peek. We lifted the outer cover on the Langs to find that the bees didn’t seem too interested in their sugar syrup. We removed the feeder and inner cover and looked down the top of the frames (without removing any). The bees were very calm. Earlier we had watched bees flying in and out of these hives, some with pollen on their legs, so I think they are good. The TBH was consuming up to 100 ml of syrup per day, hopefully using the energy to build comb so the queen can lay eggs. We opened the side of the hive. At first I thought the bee crawling around the inside of the cage was the queen. Then I realized is was a worker bee, and the queen was gone. Inside the hive, the bees were clustered near the entrance. We couldn’t tell but hopefully the queen was in there and they had started building comb. Today is the following Saturday, and I just checked the hives. It is under 50 degrees, so the bees are bundled up inside. If we get some warmer weather, the plan is to open the hives this weekend and make sure the queens are laying. Our post uses the title of one of Emily Dickinson’s bee poems. Bee! I’m expecting you! is a letter from Fly about how Bee is expected soon. It’s a great little poem and so short it is worth a read. Seriously, go read it now. While I have been waiting for months to have bees, I never thought I would get all of them on the same day. I do not recommend it. Still, I have bees! I’ve been there with the late night hammering. Never quite that late though! Congratulations on your new beautiful bees. I love your set-up with the little fence. Is that your own garden? Yes, we have an small field on the side of the house, so built the fence and planted some shrubs. Really does look nice, if I may say so.